This post is part of KQED’s Do Now U project. Do Now U is a weekly activity for students and the public to engage and respond to current issues using social media. Do Now U aims to build civic engagement and digital literacy for learners of all ages. This post was written by Sophia Buscher and Victoria Staudenraus, students at St. Mary’s College of California, in partnership with the Lindsay Wildlife Experience. Hear opposing thoughts from a field biologist at the University of York and the president of the Born Free Foundation about keeping animals in zoos for conservation purposes. To respond to the Do Now U, you can comment below or post your response on Twitter. Just be sure to include #DoNowUZoo and @KQEDedspace in your posts. Although wild animals have been held captive for thousands of years, the first modern zoo opened in 1763 in Paris, France. As people became more interested in science and natural history, zoos served as a way to display and study animals. Today, zoos provide opportunities for public education and entertainment, as well as scientific research and conservation. There are about 2,800 licensed animal exhibitors throughout the U.S., which include zoos, circuses, petting farms, wildlife and marine mammal parks, and some sanctuaries. Out of these, 233 are accredited by the Association of Zoos and Aquariums (AZA). The AZA “holds animal exhibitors to high standards of animal care, science and conservation” in the United States and all over the world. Even though many animal exhibitors are still considered zoos, they have not met the requirements of the AZA and, therefore, have not been accredited. Proponents of zoos point to the fact that they educate the general public, are beneficial for scientific research, and work toward conservation efforts and captive breeding. At the San Francisco Zoo, there are educational programs for children ages 1-17. From camps, to mobile programs that bring smaller animals to schools, to family activities that look at local wildlife near the zoo, the public is able to get hands-on education about animals they may not be able to meet and learn about otherwise. The Lindsay Wildlife Experience in Walnut Creek, California, offers similar experiences to connect locals with wildlife and educate people on how they can do small things to help benefit wildlife in urban areas. Zoos can also be beneficial for scientific research. Studies are sometimes better able to be completed in zoos because of the controlled environment of a zoo. Lastly, zoos help endangered populations by using captive breeding and release. The AZA’s Species Survival Plan Program is a long-term plan that incorporates conservation breeding, preservation of habitat, education and research to support the survival of threatened and endangered species. Many zoos also work on local conservation efforts to maintain local wildlife populations. On the other hand, many would say that wild animals should not be held in captivity. 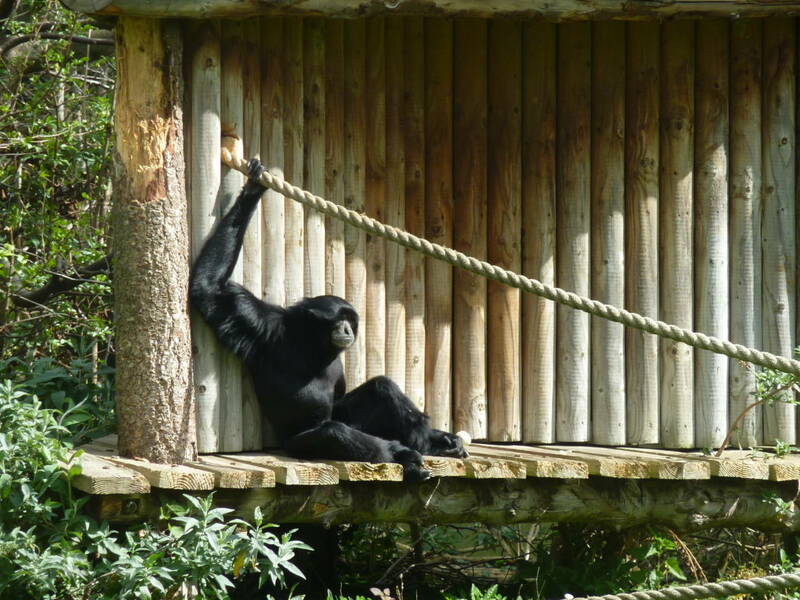 It has been argued that captive breeding isn’t always effective, zoos do not provide natural habitats, and that zoos put unnecessary stress on animals. Some studies have shown that reintroduced animals have high mortality rates because they are poorly adapted and lack the skills needed to survive in the wild. Since an animal’s well-being is dependent on their environment, some contend that zoos do not provide healthy habitats for animals. Enclosures–even when designed to mimic an animal’s natural habitat–are still not really natural. And, zoos can’t really provide the space that large or wide-ranging animals, like elephants, are used to. Due in part to unnatural enclosures, animals in zoos are under stress. Animals are often bored and, as a result, some become aggressive and can lash out at other animals or zookeepers. In a study done on 40 chimpanzees in six different zoos, all of the chimps exhibited behavior their counterparts in nature did not. Some of these behaviors included rocking back and forth, tearing out their hair, self-mutilation, and the drinking of their urine. This behavior is not seen in their wild counterparts suggesting that being in the zoo is causing these chimps to develop mental illness due to stress. What do you think? Should animals be kept in zoos? Why or why not? Hear about some of the benefits zoos and some of negative effects that they have on animals. Horizon: Should We Close Our Zoos? This clip briefly examines the history of zoos, and questions experts and professionals about keeping animals in small enclosures. Not everyone enjoys their visit to the zoo. Hear why Tim Zimmerman believes we should reconsider our arguments for keeping zoos open. He offers an alternative to traditional zoos that can make both animals and human visitors happy. From protecting elderly animals to preserving endangered species, read more about the benefits of holding animals in captivity. Find best practices for using Do Now, using Twitter for teaching, and using other digital tools. Some sources/links do not work in this piece, for example, “2,800 licensed animal exhibitors” links to the AZA page. It gives no source for that number. The link in the “high mortality rate” goes to a blank page. Instead of repeating the AZA’s press release, how about a little bit of critical analysis of the organization’s inherent conflict of interest? It’s very existence is to promote zoos. And conclusions are left hanging. “Lastly, zoos help endangered populations by using captive breeding and release.” Release? Most zoos don’t even attempt it. How about some examples, figures, stats, anything? None of the captive-bred mega fauna – elephants, chimpanzees, gorillas, tigers, for example – have ever been released to the wild. I understand this wasn’t meant to be a scholarly piece, but fundamental critical thinking skills must be employed. Even though zoo’s are beneficial to scientific research I feel as if these animals should live their life as they are desired to. So they are the animal we all fascinate over not a pet. I would have to say that it’s incredibly selfish for us to keep animals caged up just for the sake of entertainment. Granted, the article does mention that zoos serve as a tool for research, but I don’t believe that our desire for inquiry should outrank the safety and freedom of animals, and subject them to such miserable conditions. i believe that animals should not be in zoos any more because it is like a jail for humans. However, there are some benefits for animals living in the zoo, they can have sweet food and be in a nice environment. In my opinion, i believe that animals have to be free to live where they want without humans help. Animals are as responsible as humans to do whatever they want. Zoos should be closed. Putting animals in zoos is just like how prison is to people. It is completely cruel and just inhumane. They belong out in the wild with all the space they want and need. It is not fair to them and we do not own them. They should have the same freedom as we do. We only put people in cages when they are bad, but why are we putting innocent animals in cages? They usually end up super depressed and are just overall upset there. Zoos are not important enough to torture these animals just for our own entertainment. let go in the wild , people might agree to do t- WAIT A SECOND…. if we make it nice it cant defend itself when others animals come. Animals shouldn’t be kept in zoos. They are in there for our entertainment not theirs. When you put an animal in a zoo it can cause them to lose a lot of things like hunting and other things that they might do in the wild! They should be free!!! Prev Should Animals Be Kept in Zoos? Next Will Robots Replace Us At Work?